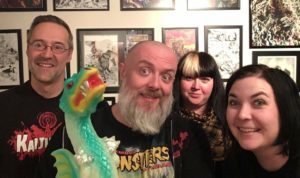 Mart, Kyle, Gretchen and Rachel cover Reptilicus (1961), the final movie in the Daikaiju Discussion list (version 1, that is)! And another year closes with the discussing of a movie, but that’s not all this episode represents – ladies and gentlemen, we have now covered all NINETY films from the daikaiju discussion list. 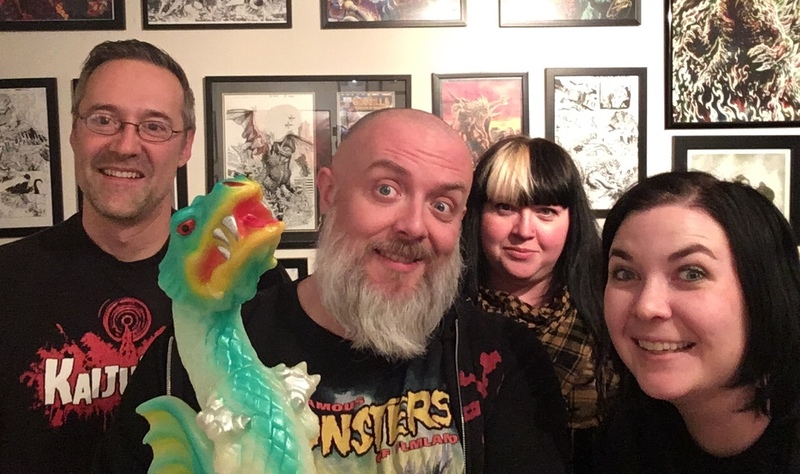 Episode 222 (that’s this one) marks the end of an eight-year project… kind of hard to believe, but things aren’t over for our movie watching and talking. Are you all ready for the next round of homework assignments? See below! This month, we watched Reptilicus (1961), a Danish/American giant monster on the loose co-production. Trying to see past the flaws was difficult at times, but I think we overall loved this “so bad it’s good” movie. In fact, you might say we loved its repdiculousness! Congrats to Daisuke Sato and Keizo Murase on their campaign’s funding! Is it true?? Is the discussion over????? Well… Yes and no. We started this segment so early in the podcast’s life the a lot of listeners have missed out on a lot of the films that we’ve covered. Therefore, during most of 2018, we will be revisiting some of the classics that we’ve already covered. These will be entirely new discussions, so you can still send in your homework (aka your thoughts, questions and reviews). The schedule has been given an addendum. So “yes”, because we made it to the end of the list of 90 titles, but also “no” because we’re doing sort of a “listeners’ choice” / best of kind of project. We’ll be watching the Kraken BluRay release for this viewing – and most likely the Japanese version. If you’d like to send in your brief thoughts, questions or reviews, make sure to do so before January 25th to have your homework included in the discussion. I don’t know about you, but I am very much looking forward to getting back to some actual Godzilla films this year!